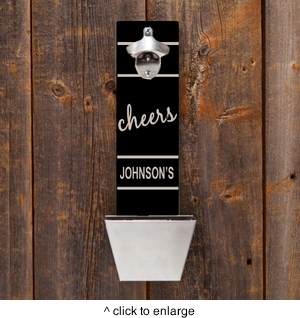 DETAILS: Our unique bottle opener and cap catcher will be a fantastic addition to the décor of your home bar. Featuring 4 new designs. Personalization included with one line of text up to 15 characters. The opener/catcher includes keyhole mounting holes on the back side and vent holes in the bottom.